For more than 10 years, the Big Bang collection has confirmed its adaptability to all styles and tastes. From understated to more dressy outfits, in jeans mode, linen, embroidery or Pop art, multifaceted and always on trend, the Big Bang really does tick all the boxes. The interchangeable ‘One Click’ straps are to the Big Bang what accessories are to your wardrobe—essential. The Big Bang ‘One Click’ is now getting dressed up with a leather strap enhanced with the softness and exceptional nature of Orylag. In 2016, Hublot presented its new women’s Big Bang. A 39-mm case in King Gold or steel, with bezel and/or case paved with diamonds, black or white dial, and the patented ‘One Click’ attachment system—allowing the strap to be changed quickly and more easily. As many visions as there are infinite possibilities of variations. So much more than a statutory accessory, Hublot makes its straps into fashion accessories imbued with creativity and innovation. 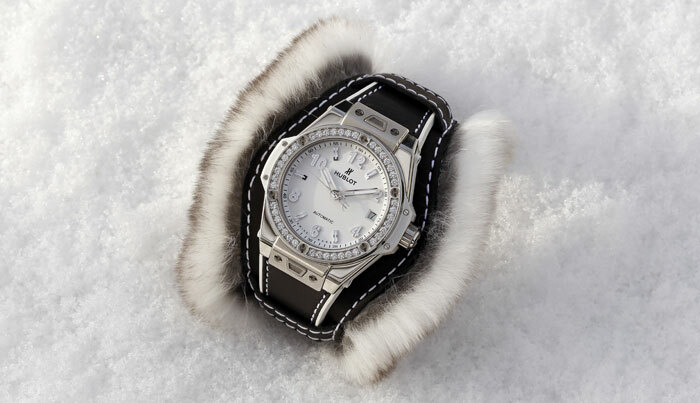 Hublot dresses wrists with audacity under the guise of a leather strap, lined with Orylag rabbit down. An oversize strap, an asserted silhouette and a stylised look that lends itself to every fancy in natural or tinted shades. Thanks to the expertise of an artisan fur specialist, the down has been worked so as to offer a gradation of colours. Mottled grey, electric turquoise and fuchsia dress the fur and the stitching of the strap. Over time, over the seasons, trends and desires, the Big Bang ‘One Click’ 39 mm is the new “It watch”, with Cuddly Cuff straps which, like jewellery, are just asking to be worn on the wrist. Orylag is an exceptional artisanal material made in France, a result of research by INRA (National Institute of Agricultural Research). A down composed of extremely fine hairs of unequalled softness. A rare and precious material, respectful of the animals and whose natural tanning preserves the environment. Ethical breeding, whose meat is appreciated by the greatest chefs and whose down is used by the greatest luxury houses and chosen by leading stylists.